Firewall Analyzer supports LEA support for R54 and above and log import from most versions. where $FWDIR is the directory where Check Point is installed. Check Point LEA is not supported on Firewall Analyzer 64 bit installation. You need to do the following in Smart Dashboard of Check Point Firewall. Open the "Smart Dashboard" where all the rules will be displayed. Set the "Track" value as "Account" instead of "log" for all the rules that are allowing the traffic through the Firewall. This can be done by right clicking on "Track" value for each rule and select "Account". When this is set to "Account" the Check Point firewall will log the information regarding bytes. After setting the "Track" value as "Account"for all the rules, please install all the policies. There is no separate configuration required in Firewall Analyzer for receving logs from Virtual Firewalls of the Check Point physical device. If orig_name attribute is present in the syslog data, then Firewall Analyzer considers that the log source is virtual firewall (vdom). Otherwise the application considers that the log source is physical device. The recognition of logs from the virtual firewall is automatic and no manual configuration is required. If you configure LEA connection, the logs will be collected automatically and processed by the Firewall Analyzer. Whereas, if you want import the logs, manual intervention is required. You need to export the syslogs in Check Point Management Station or from Check Point Smart Tracker UI and then manually import the syslog file in Firewall Analyzer. The following instructions will help you set up an authenticated or unauthenticated connection between Firewall Analyzer and the Check Point Management Server. For additional information please refer the Check Point documentation or contact Check Point technical support. Carryout the configuration in the Check Point Firewall Management Station. Add a rule to the policy to allow the port defined above port 18184 (assuming default LEA connection port) from the Firewall Analyzer machine to the Check Point Management Server and vice versa. Once this unauthenticated LEA connection has been set up, follow the instructions for Adding an LEA Server to the Firewall Analyzer. If you are unable to view the Check Point Firewall reports refer the Trouble Shooting Tip. Initialize Secure Internal Communication (SIC) for this OPSEC Application Object and enter the activation key (e.g. def456). Note down this activation key, as you will need it later. Write down the DN of this OPSEC Application Object. This is the Client Distinguished Name, which you need later on. Open the object of the Check Point Management Server and write down the DN of that object. This is the Server Distinguished Name. Add a rule to the policy to allow the port defined above, as well as port 18210/tcp (FW1_ica_pull) in order to allow pulling of PKCS#12 certificate from the Firewall Analyzer to the Check Point Management Server. The port 18210/tcp can be shut down after the communication between Firewall Analyzer and the Check Point Management Server has been established successfully. 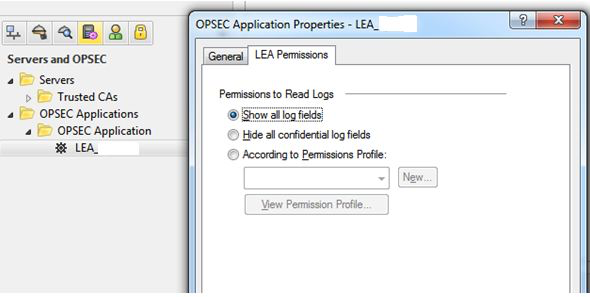 OPSEC Application - Object Name This is the applications NAME that is defined when creating the application object in the Policy Editor under the OPSEC Applications Properties Name field. OPSEC Application - Activation Key This is the one time password (Activation Key) that was defined when clicking 'Communications' in the OPSEC Applications Properties window. OPSEC Application - SIC Name The SIC name of the OPSEC Application LEA client (the LEA Server on Firewall Analyzer), in the case of authenticated connections. LEA Server - SIC Name The SIC name of the Check Point Management Server. Open the Smart View Tracker and click on View > Query Properties. How to create and export plain text Check Point log file, which can be imported in Firewall Analyzer? For Non-LEA connections, there are two ways to create and export plain text Check Point log file, which can be imported in Firewall Analyzer. For LEA connections you can skip the below mentioned methods and follow the LEA configuration instructions. where, -d refers to delimiter, -i refers to input log file, -o refers to output ASCII file, and -n implies don't perform DNS resolution of the IP addresses in the Log File (this option significantly improves processing speed). For detailed information please refer the Check Point documentation or contact Check Point technical support. The above command creates an ascii file named exportresult.log. Copy or transfer this file to Firewall Analyzer machine. Now you can Import this log file in to Firewall Analyzer. In the Check Point Smart Tracker UI (UI where you are seeing all logs in Check Point Management Station), select All Records option in the left tree. Give a proper file name, e.g., exportresult.log. Copy or transfer this file to Firewall Analyzer machine. Now you can Import this log file in to Firewall Analyzer. Log Exporter is already integrated in version R80.20. There is no need to install dedicated package. In order to support exporting logs in CEF format, please install R80.20 Jumbo Hotfix Take 5 and above. Install this release on a R80.10 Multi-Domain Server, Multi-Domain Log Server, Security Management Server, Log Server or SmartEvent Server. Log Exporter can be installed on top of R80.10 Jumbo Hotfix Take 56 and above. This hotfix must be installed after the Jumbo, and will need to be uninstalled to upgrade to a higher Jumbo take, and then reinstalled after the newer Jumbo is in place. Take care to install the latest Log Exporter take available for download below, in order to avoid a conflict with the Jumbo HF. Install this release on a R77.30 Multi-Domain Server, Multi-Domain Log Server, Security Management Server, Log Server or SmartEvent Server. Log Exporter can be installed on top of R77.30 Jumbo Hotfix Take 292 and above. **This hotfix must be installed after the Jumbo, and will need to be uninstalled to upgrade to a higher Jumbo take, and then reinstalled after the newer Jumbo is in place. Install the hotfix using CPUSE, see sk92449. After applying the hot fix, the firewall will restart automatically, you have to restart the Check Point firewall, once again. Telnet/SSH the Check Point firewall and enter the below command. This will create a new target directory with the unique name specified in the n parameter under $EXPORTERDIR/targets/<deployment_name>, and set the target configuration parameters with the connection details: IP address, port, protocol, format and read-mode. Note that the above deployment will export the logs in clear text. Click the Edit/Delete icon of the firewall for which you are unable to view reports. Click Save. Click the Enable Debugging Mode checkbox to enable the Check Point firewall in debugging mode. Should I do any changes in each Check Point cluster to forward syslogs? No. Configuring Checkpoint smart dashboard is enough. Firewall Analyzer will automatically detect clusters based on syslog field (orig_name) value. All the traffic reports are showing bytes value as zero? Open the "Smart Dashboard" where all the rules will be displayed. Set the "Track" value as "Account" instead of "log" for all the rules that are allowing the traffic through the firewall. This can be done by right clicking on "Track" value for each rule and select "Account". When this is set to "Account", the Check Point firewall will log the information regarding bytes. After setting the "Track" value as "Account" for all the rules, install all the policies. Reconfigured the Check Point certificate details, it was successful but not pulling syslogs from the firewall. Why? You should edit any of the OPSEC object values (may set the same password again) in the Check Point Management server. Then 'Save' to establish the Trust of that OPSEC object. Install Policies again in the Management sever. Now you can do the edit in Firewall Analyzer web client. User name and URL fields show "***Confidential***" in reports. why? Open Smart Dashboard. Edit Firewall Analyzer OPSEC object. Click on LEA Permissions. In the Permission to read logs, choose Show all log fields. By default, this is set to Hide all confidential log fields. Reset Firewall Analyzer OPSEC object. Go to CheckPiont server settings page in Firewall Analyzer, edit the checkpoint server and provide all inputs and save. If the issue persist, reboot Check Point management server.